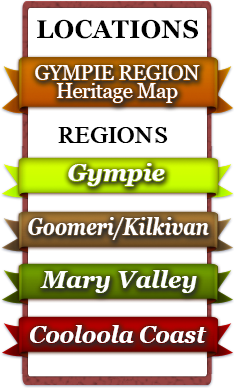 The Gympie Region covers 6,898 square kilometres and includes diverse geographical rural, urban and coastal localities. 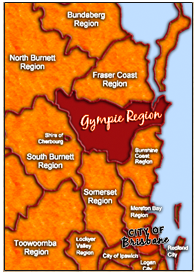 The Gympie Region is part of the Wide Bay Burnett Region, 160km north of Brisbane. 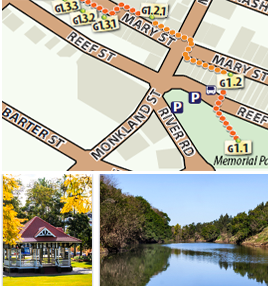 Gympie is a thriving town situated on the banks of the Mary River. 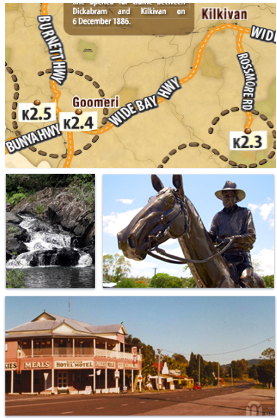 Well known for the town that saved Queensland because of the discovery of gold within the area by James Nash in 1867. This provided great stimulus and development for the area after struggling when it was separated from New South Wales eight years earlier. The town was originally named Nashville, but was changed to Gympie after a local species of stinging tree was found, known to the Indigenous Australians as the Gimpi-Gimpi. Many hopeful prospectors and business men and women flocked to the town and soon substantial buildings, such as shops, churches, music halls and hotels were built to cater to the population. This is how Gympie came into existence. Goomeri was settled in 1846. Stations were more so classified as villages because of the extensive staff and self-sufficiency during the late 19th century. In the early 20th century these stations ceased with the arrival of the railway. The railway through Goomeri was used as a siding for timber haulers and farmers. With a great land sale in 1911, many flocked to Goomeri to more permanently established the township. Goomeri’s name is allegedly derived from the Aboriginal word for “broken shield”.